Signature Iron Doors is a proud provider of quality iron products including the stunning iron railing pictured above. Wrought iron railing can add that special something you have been looking for to complete the look of your home. 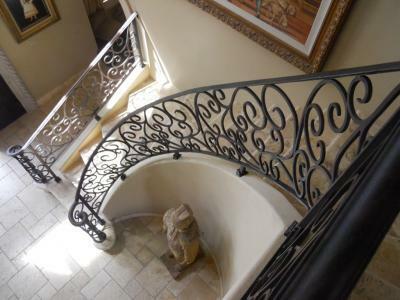 Whether its wrought iron stair railing you want to make your foyer grand or if you are looking for a little extra ornamental decor for the exterior of your home, iron railing is a fantastic option. Not only can you make your home look dramatic and elegant, you can increase the equity of your home as well. The replacement of outdated wood railing can be easily overlooked and is a great way of giving your home the look of a drastic remodel with a simple one day installation. Signature Iron Doors invites you to take a look at our website and contact us to speak to a knowledgeable representative who can help you discover the true potential of your home with the simple installation of any of our iron products.